ROADTRIP-'62 - Find all the articles about US-23, re-read your favorites or discover new stuff. Here's where you can find what we have published previously. Pages are posted in trip order, with the introduction page at the top and followed by Day 1 of the trip. If you missed a page or just want to reread a favorite, you've found the right place! 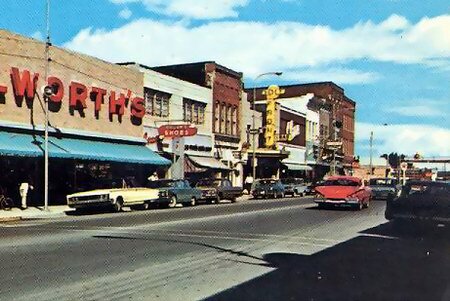 Clayton Motors, Clayton Georgia, 1960 and 2011. (Top photo used by permission of the Rabun County Historical Society). This building is now Clayton Pharmacy, and if you compare to my photo taken April 6, 2011, you can just make out the parapets at the top, along the left side, as being modified from the original building. All photos by the author and Copyright © 2012 - Milne Enterprises, Inc., except as noted. All other content Copyright © 2012, 2017 - Milne Enterprises, Inc.